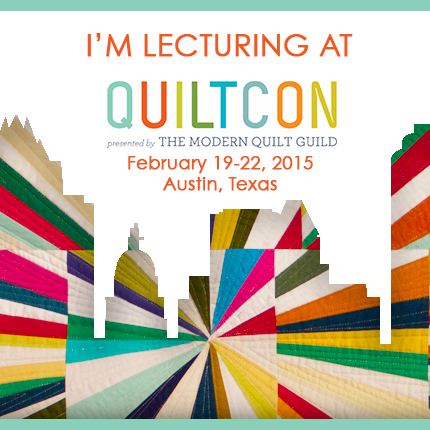 I'm really excited to share with you that I'm lecturing at QuiltCon, the biennial conference of the Modern Quilt Guild, next February in Austin, Texas. I'll be presenting two lectures, actually. The first, Large Scale Piecing, takes place Friday, February 20 from 11:00-11:45 am, and the second, Color Theory for the Modern Quilter is later that same day from 4:00-4:45 pm. Registration for my lectures, as well as all of the amazing workshops and lectures, starts June 24. For more information, please visit QuiltCon.com. I hope to see you in Austin!